The snow is starting to fly as we move into December. 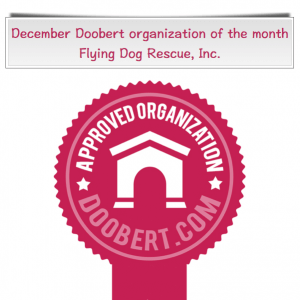 So we thought it fitting that our next Doobert organization of the month is Flying Dog Rescue, Inc. Another great organization dedicated to saving more animals, Flying Dog Rescue aims to revolutionize the transport side of things. Listen as Chris shares his passion for aviation and animals and talks about how he got into it. We know you’ll be inspired by his stories and advice for those that are new to rescues and we are humbled with the praise he heaps on the Doobert software. Happy December everyone! YouTube Video#2 – Why do you rescue? What is the Doobert organization of the month? At Doobert, we are proud to support animal rescues and shelters in the United States and around the world. We recognize the commitment and hard work of these organizations and their volunteers, and we want to do our part to help them be successful. So in addition to providing awesome software to support them, we’re also highlighting a different Doobert organization each month to help promote their cause and raise money for their efforts. Organizations selected as a Doobert organization of the month are featured in several places on our site, we support their social media efforts by working with them to create videos to tell their amazing stories and promote them across our social network, and we also feature them in our Doobert newsletter to raise awareness to other Doobert organizations and users. Become a Doobert.com User Today! Would you like to be the next Doobert organization of the month? If you’d like us to consider you to be an upcoming Doobert organization of the month you’ve come to the right place. First you have to be an approved Doobert organization so make sure you have signed up and applied for organization status. Next, send us a note and tell us why you would like to be organization of the month? What’s your organization about? Why do you rescue? We’ll get back to you with more information if you’re selected and we’ll work with you to pull together some awesome videos. July 2015 – Beingkind, Inc.